The management of unicompartmental knee osteoarthritis particularly in a relatively young population represents a unique challenge for orthopedic surgeons. When non-operative management has been exhausted, and pain and limited function persists, surgical options are considered. Non-arthroplasty options for the treatment of unicompartmental arthritis include arthroscopic debridement, cartilage restoration techniques, osteotomy or a combination of the three. Although significant advances have been made in biomaterials, implant design and arthroplasty techniques, there are still significant concerns about the durability and long-term survivorship of unicompartmental or total joint prostheses, particularly in younger, active individuals. For this reason, we believe that the “lost art” of osteotomy should be revisited to attempt to preserve the native joint as long as possible in appropriately selected patients. Joint preservation osteotomy can be performed to surgically alter malalignment and effectively unload any of the three compartments of the knee. Although there are many techniques used to perform osteotomy about the knee, the primary goal of off-loading the affected compartment to provide pain relief while maintaining or improving overall stability of the knee remains constant. Just as arthroplasty has evolved throughout time, so has the field of joint preservation. Adjunct procedures can often be performed at the time of osteotomy. Also, advances in preoperative imaging and planning, and intraoperative imaging, including computerized navigation, can allow for more accurate correction of deformity. Improvement in fixation techniques and bone grafting can now allow for earlier weight bearing and mobilization of the joint. In turn, this dramatically reduces the rate of historic complications such as inadequate or excessive correction, nonunion or malunion, postoperative fracture and arthrofibrosis. The concept of osteotomy to correct deformity about the knee has existed for thousands of years. However, it was not until the 20th century that the use of distal femoral and proximal tibial osteotomies gained widespread acceptance as treatment options for osteoarthritis of the knee. The 1960s ushered in the “modern era” of knee osteotomy for the treatment of osteoarthritis of the knee. Despite some successes in treatment, the techniques were primitive and the outcomes, unpredictable. Most notably, the postoperative fixation used was typically in the form of cast immobilization or stapling, providing limited early stability and, therefore, requiring prolonged postoperative immobilization. More recent advancements had supplanted these tenuous fixation devices with methods commensurate with the AO principles of rigid internal fixation of fractures. Not surprisingly, these advancements have resulted in better outcomes and more precise correction of deformity than was previously seen. The greatest predictor of successful outcome after osteotomy about the knee is appropriate patient selection. When conducting a history and physical examination, it is important to consider the patient’s age, activity level, occupation, comorbidities, history of trauma and previous conservative and surgical treatments and the benefit of those modalities. Patients should also be asked about their use of tobacco or nicotine products, as this could influence the healing potential of the osteotomy site. Next, have the patient define the location, character and intensity of pain as well as precipitating and mitigating factors or activities. Another factor that cannot but overemphasized is the patient’s expectations and the activity level he or she hopes to resume after surgical treatment. 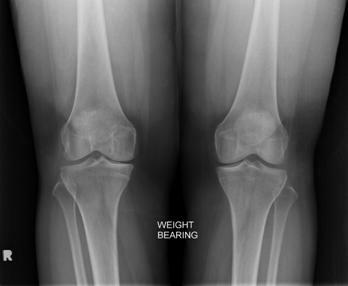 Clearly, osteotomy, even in conjunction with cartilage restoration techniques, does not completely halt or reverse the process of knee degeneration. In fact, we have few data that can support the idea of delaying progression of arthritis. Osteotomy serves to unload the compartment, decreases pain, and, hopefully, improves function. The patient needs to be aware of the proposed goals. A history of true mechanical symptoms in the knee such as clicking, locking or instability should also be elucidated and, if appropriate, addressed at the time of intervention. In the case of patellofemoral degenerative arthritis secondary to instability, the number and circumstances of patellar dislocation should be determined. Typically, patients with advanced patellofemoral degenerative arthritis will no longer complain of instability, but it remains important for the treating surgeon to consider the contribution of malalignment/maltracking when planning for osteotomy. Physical examination of the patient should always begin with an assessment of gait pattern and overall lower limb alignment. Gait should be observed and evaluated for abnormal thrusts or other evidence of functional instability. Range of motion should be very critically evaluated, as osteotomy will typically only worsen contractures and is therefore, a relative contraindication. Intrinsic stability of the knee should be evaluated in a coordinated fashion, focusing on the competence of the anterior and posterior cruciate ligaments, as well as the medial and lateral collateral ligaments. Significant coronal laxity should be further qualified by its ability to be corrected to neutral, indicating that extensive contracture of the collateral ligaments has not occurred. The patella should be evaluated for excessive laxity and maltracking. Patients with a history of recurrent dislocations or instability should be assessed for generalized ligamentous laxity or hypermobility syndromes. Finally, any incisions should be noted and when possible, operative reports and intraoperative imaging obtained. Imaging should always begin with plain radiographs prior to advancing to computed tomography (CT) or magnetic resonance imaging (MRI) scans. Radiographs should include bilateral anteroposterior standing views, bilateral posteroanterior weight-bearing views at 30° of flexion, Merchant views and weight-bearing lateral typically at 30° of flexion. A full-length alignment view in double-limb stance allows for assessment of mechanical axis and alignment. In cases of suspected patellar alignment, the tibial tubercle-trochlear groove distance can be measured on CT or MRI scans of the knee, which can aid the surgeon in planning for distal realignment osteotomy. In cases of excessive femoral anteversion, we will typically obtain a rotational CT scan. Many patients will respond positively to activity modification, NSAIDs, viscosupplementation and unloader braces for long periods even in the setting of advanced unicompartmental arthritis. These treatments should almost always be attempted prior to a discussion of surgical intervention. In our experience, patients who respond positively to medial or lateral unloader braces, even transiently, tend to have better outcomes after high tibial or distal femoral osteotomy, respectively. However, we typically find that compliance with unloader braces is poor due to patient discomfort and pain. Therefore, we do not feel that a trial of brace wear is absolutely necessary in the decision-making process. Conversely, patients with advance patellofemoral arthritis may actually have a worsening of symptoms when attempting to wear patellofemoral braces (J-brace) designed to treat instability and further constrain rather than unload the patellofemoral compartment. A recent retrospective view looked at the 13-year to 21-year follow-up of HTOs performed for medial-sided arthritis and showed survivorship of 98% at 5 years, 92% at 10 years and 71% after 15 years with good satisfaction rates. Ultimately, only 24% of the patients went on to total knee arthroplasty during that time period.3 Hui et al studied long-term outcome after HTO and found that HTO can be extremely effective, but that the results deteriorated after about 15 years.4 Factors associated with better outcomes in this study were age younger than 50 years, normal body mass index (BMI) and ACL deficiency. Many other studies also indicated favorable results at short-term and intermediate-term follow-up in terms of restoration of function and pain relief.5-10 Achieving optimal alignment after HTO is the most important factor leading to satisfactory outcomes.6,9,11 Coventry showed that the results of HTO are best when the knee is corrected to 8° to 10° of valgus.6 Improved outcomes have also been shown to occur when the postoperative weight-bearing line passes through the lateral plateau at 62.5% of the width of the plateau,12 producing the desired 3° to 5° of mechanical valgus at the knee. However, appropriate preoperative planning is paramount as not all patients will be corrected to the same extent. Failures have previously resulted due to overcorrection. Medial compartment osteoarthritis of the knee can be treated by medial opening-wedge osteotomy or lateral closing-wedge osteotomy. Advantages of the opening-wedge technique include 1) restoration of anatomy by addition of bone to the medial side of the knee; 2) the achievement of predictable correction in coronal and sagittal planes; 3) the ability to adjust correction intraoperatively; 4) the need for only one bone cut; 5) avoiding proximal tibiofibular joint disruption and 6) the relative ease of performing concomitant procedures such as ACL reconstruction.13 The greatest disadvantage of opening wedge technique is that it requires the creation of a bony defect. This void needs to be filled with graft bone, potentially leading to a higher risk of nonunion as well as longer postoperative periods of restricted weight-bearing. Lateral closing wedge osteotomy is a reproducible procedure and serves as an alternative to medial opening wedge in certain cases. The lateral closing wedge technique may be preferred in certain patients, especially when healing of the osteotomy site is of particular concern. If nonunion has occurred after medial opening wedge HTO, closing wedge is an excellent option. A woman aged 46 years who worked as a school-teacher presents with 7 years of worsening medial-sided right knee pain. The patient is a non-smoker and non-diabetic with only mild hypertension. She has a BMI of 28 kg/m2. The patient initially attempted activity modification – she stopped running – and NSAIDs with moderate relief. She had moderate but short-lived response to corticosteroid and viscosupplement injections. She also had some relief with a medial unloader brace, but was unable to wear it for long periods of time due to discomfort and skin irritation. 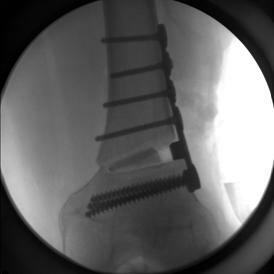 Partial medial meniscectomy and debridement had been performed 2 years prior with no change in the patient’s symptoms. Standardized radiographs were performed including weight-bearing anteroposterior and posteroanterior at 0° and 30° of flexion, respectively, weight-bearing lateral at 30°, and bilateral Merchant views. The radiographs showed early medial joint space narrowing, but an otherwise well preserved joint (Figure 1). Long-leg standing cassette with the feet shoulder width apart and in neutral rotation at the hips was performed to assess overall limb alignment (Figure 2). The weight-bearing axis is drawn as a line from the center of the femoral head to the center of the ankle mortise (blue line). In a varus knee, this line passes through the medial compartment. A point of desired correction is determined. 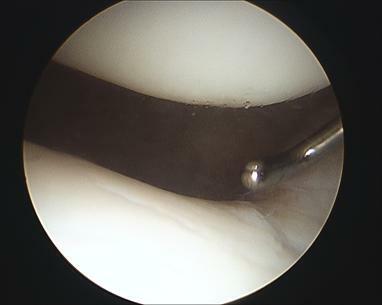 In cases of cartilage restoration (meniscal transplantation or treatment of focal chondral defects with OATS or microfracture) or very mild degenerative changes, the desired final alignment may be neutral. In cases of more involved degeneration, we pick a point 62% along the tibial plateau or just off the lateral aspect of the lateral tibial spine. 2 lines are drawn (yellow) through this point from the center of the femoral head and center of the ankle mortise. The angle (angle A) formed by the intersection of these two lines represents the angle of correction that will shift the weight bearing axis to the desired location. One should be cautioned against over-correction and all patients should be counseled about the potential for cosmetic asymmetry. Patients who are not willing to accept these issues are not candidates for valgus producing osteotomy. 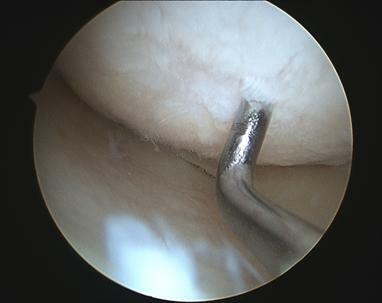 In this case, another surgeon performed the prior arthroscopic meniscectomy, so a diagnostic arthroscopy was performed prior to proceeding with osteotomy. Diagnostic arthroscopy revealed a relatively normal patellofemoral and lateral compartment (Figure 3). The medial compartment showed diffuse grade II-III changes most pronounced at 0° to 30° of flexion (Figure 4). Otherwise, the knee was normal without evidence of significant meniscal or ligamentous pathology. After arthroscopy, a vertical incision was made distal to the joint line centered between the medial edge of the patellar tendon and posterior border of the tibia. Full thickness subcutaneous flaps are developed down to the level of the sartorius fascia. The sartorial fascia is incised and the pes anserine tendons are elevated exposing the anteromedial tibial. The superficial medial collateral ligament is typically released and subperiosteal dissection is taken around the posteromedial tibia all the way to the level of the popliteus. 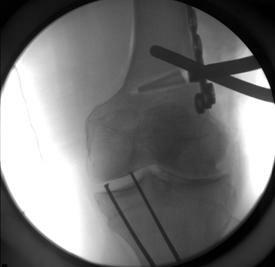 Safety retractors are placed around the posteromedial tibia at the time of osteotomy. The desired degree of correction should have been determined prior to surgery. A cortical osteotomy is performed with an oscillating saw and variable sized wedges are placed to gradually open up the osteotomy site. Care is taken not to violate the lateral cortex or articular surface. When opening the osteotomy, be conscious of alterations in tibial slope. In general, the anteromedial aspect of the osteotomy should open about 50% when compared with the posteromedial portion of the osteotomy site. If the osteotomy site is equal throughout, the osteotomy has been created in an anterior to posterior direction rather than medial to lateral. This will result in increased tibial slope and decreased coronal plane correction. The osteotomy site can be grafted with autograft or allograft bone, or appropriate bone substitute. Fixation should be rigid and allow for early weight bearing (Figure 5). The patient is placed in a postoperative hinged knee brace and will be go through progressive partial weight bearing over the next 6 weeks to 10 weeks based on radiographic healing of the osteotomy site. Full weight bearing typically occurs at 6 weeks to 8 weeks. If union has occurred at 3 months to 4 months, the patient can be released to near full activity (Figure 6). Distal femoral osteotomy is typically employed to correct deviations in lower limb mechanical axis when the deformity is determined to be primarily in the distal femur. Typically in cases of lateral compartment disease or acquired valgus deformity, significant obliquity of the tibiofemoral joint line is present. In such cases, overall limb alignment can be corrected with tibial osteotomy, but the obliquity of the joint will not be addressed. For this reason, distal femoral osteotomy is usually the treatment of choice to unload lateral compartment arthritis. Recent publications have shown good results using distal femoral opening and closing wedge osteotomy techniques, particularly in patients with valgus deformities.14-16 Medial closing wedge and lateral opening wedge techniques have been well described. Opening wedge techniques carry the same concerns for delayed or nonunion as in HTO opening wedge technique. Internal and external fixation devices are available to the treating surgeon, with specific advantages and disadvantages associated with each method.17 One study suggests that the use of internal or external fixation techniques should be up to the discretion of the surgeon based on his or her comfort level, and that one is not superior to the other.18 Despite the good long-term results of distal femoral osteotomy, researchers have observed that at 20 years postoperatively a large number of patients will require conversion to total knee arthroplasty15. A construction worker aged 29 years presented with chronic left lateral knee pain. The patient was in a motor vehicle accident 8 years earlier. He had surgery at that time for a chondral fracture and remained asymptomatic for 3 years. Pain gradually worsened and was affecting daily activities. The patient failed bracing, activity modification, NSAIDs, corticosteroid injections and viscosupplementation. The patient’s goal was to return to reasonable level of function without pain during daily activities and work. Standardized radiographs were again performed revealing significant lateral joint space narrowing, but an otherwise well preserved joint (Figure 7). Long-leg standing cassette with the feet shoulder width apart and in neutral rotation at the hips was performed to assess overall limb alignment (Figure 8). The weight-bearing axis on the uninvolved knee was neutral but clearly passed through the lateral compartment in the involved knee (blue line). The desired angle of correction was template (yellow line). In this particular case, we did obtain MRI given the history of prior trauma and the rapid progression of degenerative changes in a relatively young individual. 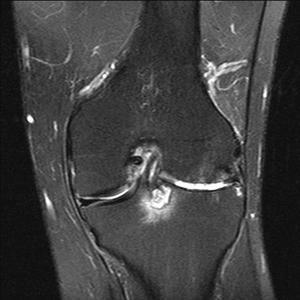 MRI revealed complete loss of articular cartilage on the femur and tibia in the lateral compartment with associated subchondral edema (Fig 9). Importantly, the medial compartment and cruciate ligaments were intact. Diagnostic arthroscopy was performed confirming the MRI findings. A vertical lateral incision was then made down to the level of the iliotibial band. The iliotibial band was incised and the vastus lateralis elevated, exposing the lateral aspect of the femur. Fluoroscopic guidance was used to plan the osteotomy location and angle. Cortical osteotomy was performed and an appropriately sized wedged dilator was placed. Osteotomy plate fixation was performed after placement of bone substitute graft and autograft bone (Figure 10). During fixation, the osteotomy propagated through the medial cortex. In this setting, the correction can be maintained, but supplemental fixation should be performed via a medial approach (Figure 11). The postoperative course is very similar to HTO with the exception of protected weight bearing for longer periods if there is any delay in healing. Risk for fracture is greater in the subchondral femur, so the patient’s activity is not liberalized until union is confirmed radiographically. As in all areas of orthopedics, complications may occur with distal femoral osteotomy and HTO. Reported complications included iatrogenic fracture, nonunion, malunion, failure to accurately correct deformity, hardware related pain, thromboembolism, neurovascular trauma, infection, septic arthritis, arthrofibrosis and complex regional pain syndrome. Appropriate patient selection and preoperative planning is the first step to minimizing complications. Fixed flexion contracture, unaddressed ligamentous instability, and bicompartmental or tricompartmental arthritis are generally considered contraindications to osteotomy. Tobacco use must be discussed with all patients because the rate of nonunion increases significantly regardless of technique. In our practice, smokers who wish to consider osteotomy are referred to a formal smoking cessation program. Osteotomy is rarely performed in a smoker but when it is only closing wedge techniques are employed. Metabolic bone disease and end-stage renal disease are relative contraindications to osteotomy as well. Our preoperative blood work always includes a vitamin D level and if it is deficient, patients are supplemented prior to undergoing surgery. There has been recent interest in the use of computer navigation for more accurate deformity correction. Jackson et al reported that the use of computer navigation assists in making an appropriate osteotomy without the burden of excess surgical or intraoperative fluoroscopy time.21 The treating surgeon should employ a system that allows for reproducible results. Typically, we consider the use of computer navigation in addition to intraoperative fluoroscopy in cases of atypical developmental or posttraumatic deformity. The treatment of patellofemoral disorders represents a diverse and often frustrating field. Numerous soft tissue and osseous realignment procedures have been described for the treatment of patellofemoral instability. In this section, we will be discussing the clinical application of tibial tubercle osteotomy for the treatment of patellofemoral chondrosis and arthritis. Patellofemoral arthritis may be the result of recurrent instability, unaddressed malalignment, overuse, trauma, obesity or other factors. Prior to consideration of surgical intervention, the treating surgeon must consider and appreciate the presence of joint hypermobility, frequency and circumstances of previous instability episodes, overall limb alignment in both coronal and axial planes, presence of patellar tilt, trochlear dysplasia and previous treatments and relative success. The medial patellofemoral ligament (MPFL) has garnered significant attention recently for its role in preventing lateral patellar instability. In patients with advanced patellofemoral arthritis, MPFL reconstruction is rarely considered as this represents a “joint constraining” procedure. More commonly, distal realignment or anteromedialization (AMZ) osteotomy of the tibial tubercle is performed in cases of patellofemoral arthritis. The geometry of the osteotomy can be modified to address the specific case at hand and correct mechanical axis deviations while also offloading the patellofemoral articular surface.22 An excessive Q-angle is a primary determinant of lateral patellar instability. The Q angle can be measured indirectly on CT or MRI scans using the overlap technique to measure the tibial tubercle-trochlear groove (TT-TG) distance.23 If this measurement is greater than 20 mm, the Q angle is considered abnormal and distal osteotomy should be performed in a manner that corrects the TT-TG distance. Fulkerson originally suggested that younger patients with isolated patellofemoral instability in the absence of arthrosis had better results from the intervention after tibial tubercle osteotomy.24 More recent studies have shown excellent results in appropriately selected patients even with advanced patellofemoral arthritis. Paulos published a series where more than 90% of patients would undergo the procedure again.25-26 Beck has elegantly described trochlear contact pressures that occurred after Fulkerson osteotomy and found that although the lateral trochlea is significantly unloaded, the medial aspect of the joint can in fact be overloaded.26 Therefore, it cannot be overemphasized that all cases be individualized. 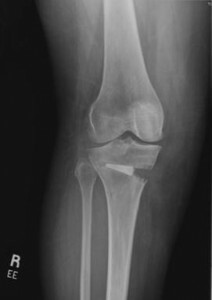 In pan-patellar disease or advanced medial facet arthrosis, anteriorization can be performed without medicalization (Maquet osteotomy). In our practice, patients with early chondrosis and continued instability/maltracking are typically considered candidates for conventional Fulkerson/ 45° AMZ osteotomy. Patients with more advanced lateral facet disease and lesser degrees of instability are routinely indicated for steeper corrective AMZ osteotomy (60° AMZ), whereas patients with panpatellar disease, central arthrosis are considered candidates for Maquet osteotomy or 90° AMZ osteotomy dependent upon associated factors. In all cases, we perform diagnostic arthroscopy prior to final decision as to the exact osteotomy configuration. Although it makes intuitive sense that anteriorization of the tibial tubercle should offload the patellofemoral joint and result in improved joint pain postoperatively, there is a relative paucity of data to assert this assumption. A recent study looked at 50 knees treated with an anteriorizing tibial tubercle osteotomy treated over a 14-year period and found that the procedure can be quite effective for relief of anterior knee pain with overall high satisfaction scores in patients undergoing the procedure. However, the authors also cautioned that there is an approximately 10% rate of deterioration of the patellofemoral joint over a 93-month period, as well as a 12% risk of major complications, including fracture27. A woman aged 42 years presented with chronic anterior knee pain and difficulty with daily activities, particularly ascending and descending stairs. She had minimal relief with physical therapy, NSAIDs and viscosupplementation. 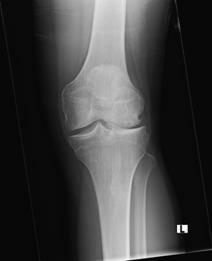 Standardized radiographs were performed revealing only mild bilateral patellar tilt. 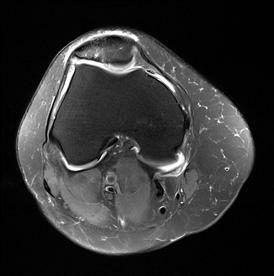 MRI revealed full thickness cartilage loss on the distal/ lateral aspect of the patella (Figure 12). The TT-TG distance was calculated at 19 mm. The remainder of the knee was normal. Diagnostic arthroscopy was performed and minimal debridement of the patellofemoral joint performed. An 8 cm incision was made over the anteromedial edge of the tibial tubercle. Full thickness flaps were developed. The fascia overlying the anterior compartment was incised and subperiosteal dissection performed elevating muscle off the lateral aspect of the tibia. Retractors were placed and the proposed angle of ostetomy performed based on the preoperative plan. In this case, we performed a 60° osteotomy yielding 1 cm of anterior translation and 0.5 cm of medicalization (Figure 13). This produced the desired effect of unloading the patellofemoral compartment while returning the TT-TG distance to normal. Weight bearing is protected for 6 weeks to 8 weeks based on radiographic evidence of osteotomy healing. Close attention is paid to the distal tip of the ostetomy where delayed or nonunion is common. The patient can typically return to normal daily activities at 3 months to 4 months, but avoidance of pounding or stressful activity is discouraged until 6 months after surgery. Complications after tibial tubercle osteotomy include; infection, nonunion, malunion, persistent pain and instability, symptomatic hardware and, of course, postoperative fracture.28-29 To reduce the risk for fracture, early weight bearing is discouraged until clinical and radiographic evidence of union is present. In our series, delayed union is not uncommon and should be suspected in all patients who present with continued pain more than 2 months to 3 months after surgery. As with other osteotomies, preoperative vitamin D levels are checked and repleted when appropriate. Again, nicotine use is a relative contraindication to tubercle osteotomy. 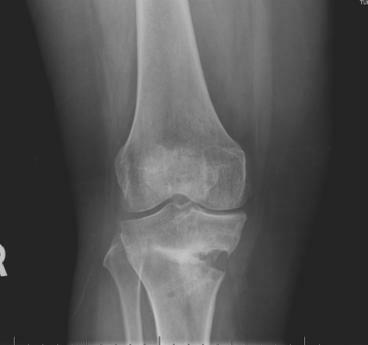 Due to the relative risk for fracture, some authors discourage strenuous activity for up to 1 year after the procedure or until radiographic healing is present.29-30 We typically allow patients to participate in all activity at 4 months to 6 months after surgery, if clinical and radiographic union are present. 1. Brouwer RW, Raaij van TM, Bierma-Zeinstra SM, et al. Osteotomy for treating knee osteoarthritis. Cochrane Database of Syst Rev. 2007; doi: 10.1002/14651858.CD004019.pub3. 2. Schallenberger A, Jacobi M, Wahl P, et al. High tibial valgus osteotomy in unicompartmental medial osteoarthritis of the knee: a retrospective follow-up study over 13-21 years. Knee Surg Sports Traumatol Arthrosc. 2011;19(1):122-127. 3. Hui C, Salmon LJ, Kok A, et al. Long-term survival of high tibial osteotomy for medial compartment osteoarthritis of the knee. Am J Sports Med. 2011;39(1):64-70. 4. Billings A, Scott DF, Camargo MP, Hofman AA. High tibial osteotomy with a calibrated osteotomy guide, rigid internal fixation, and early motion: long-term follow-up. J Bone Joint Surg Am. 2000;82(1):70-79. 5. Coventry MB , Ilstrup DM, Wallrichs SL. Proximal tibial osteotomy: a critical long-term study of eighty-seven cases. J Bone Joint Surg Am. 1993;75(2):196-201. 6. Insall JN, Joseph DM, Msika C. High tibial osteotomy for varus gonarthrosis: a long-term follow-up study. J Bone Joint Surg Am. 1984;66(7):1040-1048. 7. Ivarrson I, Myrnerts R, Gillguist J. High tibial osteotomy for medial osteoarthritis of the knee: a 5 to 7 and 11 year follow-up. J Bone Joint Surg Br. 1990;72(2):238-244. 8. Naudie D, Bourne RB, Rorabeck CH, Bourne TJ. The Install Award: survivorship of the high tibial osteotomy: A 10- to 22-year followup study. Clin Orthop Relat Res. 1999;367:18-27. 9. Rinonapoli E, Mancini GB, Corvaglia A, Musiello S. Tibial ostetomy for varus gonarthrosis: a 10- to 21 year follow-up study. Clin Orthop Relat Res. 1998:185-93. 10. Yasuda K, Majima T, Tsuchida T, Kaneda K. A ten- to 15-year follow-up observation of high tibial osteotomy in medial compartment osteoarthrosis. Clin Orthop Relat Res. 1992;282:186-195. 11. 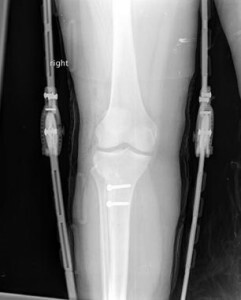 Dugdale TW, Noyes FR, Syter D. Preoperative planning for high tibial osteotomy: the effect of lateral tibiofemoral separation and tibiofemoral length. Clin Orthop Relat Res. 1992;274:248-264. 12. Amendola A, Panarella L. High tibial ostetomy for the treatment of unicompartmental arthritis of the knee. Orthop Clin North Am. 2005;36(4):497-504. 13. Flandry F, Bowler DJ. Chapter 59: Distal Femoral Osteotomy. Surgical Techniques of the Shoulder, Elbow, and Knee in Sports Medicine. 2008: Saunders Elsevier 575-97. 14. Freiling D, van Heerwaarden R, Staubli A, Lobenhoffer P. The medial closed-wedge osteotomy of the distal femur for the treatment of unicompartmental lateral osteoarthritis of the knee. Clin Orthop Traumatol. 2010;22(3):317-334. 15. Sternheim A, Garbedian S, Backstein D. Distal femoral varus osteotomy: unloading the lateral compartment: long-term follow-up of 45 medial closing wedge osteotomies. Orthopedics. 2011;34(9): e488-e490. 16. Thein R, Bronak S, Thein R, Haviv B. Distal femoral osteotomy for valgus arthritic knees. J Orthop Sci. 2012;17(6):745-749. 17. Jiao SF, Qin SH, Wang ZJ, Wu HF, Zheng XJ. Limited internal fixation combined with external fixation for the treatment of deformity of the distal end of femur. Zhongguo Gu Shang. 2011;24(8):695-697. 18. Seah KT, Shafi R, Fragomen AT, Rozbruch SR. Distal femoral osteotomy: is internal fixation better than external? Clin Orthop Relat Res. 2011;469(7):2003-2011. 19. Koyonos L, Slenker N, Cohen S. Complications in Brief: osteotomy for the lower extremity malalignment. Clin Orthop Relat Res. 2012;470(12):3630-3636. 20. Closkey RF, Windsor RE. Alterations in the patella after a high tibial or distal femoral osteotomy. Clin Orthop Relat Res. 2001;389:51-56. 21. Jackson DW, Warkentine B. Technical aspect of computer-assisted opening wedge high tibial osteotomy. J Knee Surg. 2007;20(2) 134-141. 22. Fulkerson JP. Anteromedialization of the tibial tuberosity for patellofemoral malalignment. Clin Orthop Relat Res. 1983;177:176-181. 23. Dejour H, Walch G, Nove-Josserand L, Guier C. Factors of patellar instability: an anatomic radiographic study. Knee Surg Sports Traumatol Arthrosc. 1994;2(1):19-26. 24. Morshuis WJ, Pavlov PW, de Rooy KP. Antermedialization of the tibial tuberosity in the treatment of patellofemoral pain and malalignment. Clin Orthop Relat Res. 1990;255:242-250. 25. Paulos L, Swanson SC , Stoddard GJ, Barber-Westin S. Surgical correction of limb malalignment for instability of the patella: a comparison of 2 techniques. Am J Sports Med. 2009;37(7):1288-1300. 26. Sakai N, Koshino T, Okamoto R. Pain reduction after anteromedial displacement of the tibial tuberosity: 5-year follow-up in 21 knees with patellofemoral arthrosis. Acta Orthop Scand. 1996;67(1):13-15. 27. Beck PR, Thomas AL , Farr J, Lewis PB, Cole BJ. Trochlear contact pressures after anteromedialization of the tibial tubercle. Am J Sports Med. 2005;33(11):1710-1715. 29. Atkinson HD, Bailey CA, Anand S, Johal P, Oakeshott RD. Tibial tubercle osteotomy with bone allograft for patellofemoral arthritis: a retrospective cohort study of 50 knees. Arch Orthop Traum Surg. 2012;132(4): 437-445. 30. Godde S, Rupp S, Dienst M, Seil R, Kohn D. Fracture of the proximal tibia six months after Fulkerson osteotomy. A report of two cases. J Bone Joint Surg Br. 2001;83(6):832-833. 31. Stetson WB, Friedman MJ, Fulkerson JP, Cheng M, Buuck D. Fracture of the proximal tibia with immediate weightbearing after a Fulkerson osteotomy. Am J Sports Med 1997;25(4):570-574. Copyright © Vindico Medical Education. Unauthorized reproduction of this content is prohibited.